Anre Duncan exiting the U.S. Department of Education bus at Chicago's Schurz High School on September 9, 2011. Substance photo by George N. Schmidt.Does Duncan respect the limited role of the federal government in education, which all previous secretaries have recognized? No. Duncan has expanded the role of the federal government in unprecedented ways. He seems not to know that education is the responsibility of state and local governments, as defined by the Tenth amendment to our Constitution. States and local school districts now look to Washington to tell them how to reform their schools and must seek permission to deviate from the regulations written by the U.S. Department of Education. 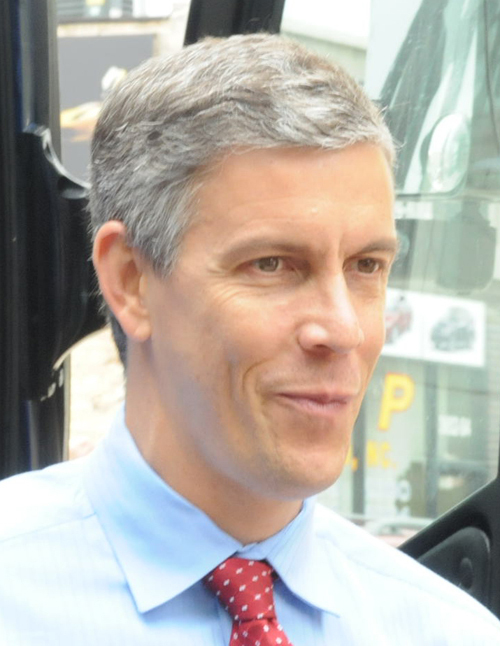 George W. Bush’s No Child Left Behind (NCLB) created the template for this growing federal control of education, but Arne Duncan’s Race to the Top has made it possible for Washington to dictate education policy across the nation. Grade: F.
Has Duncan followed the law in his education policies? No. Duncan has issued waivers to states that want to be relieved from NCLB’s impossible mandate of reaching 100 percent proficiency by 2014, but replaced that law’s demands with those of his own devising. Duncan says his waivers allow “flexibility,” but they serve simply to impose his own ideas about evaluating teachers, “transforming” low-performing schools (by firing staff or closing the schools), and adopting national standards in reading and mathematics. While very few people defend NCLB, which will write off almost every public school in the United States as a failure by 2014, it is still the law. Duncan has no authority to replace it with his own rules; cabinet members are not allowed to change the laws. Under our Constitution, Congress writes the laws, and the executive branch must enforce them, even as it seeks to change those that are onerous and misguided. Grade: F.
Has Duncan obeyed the clear prohibitions in law against federal involvement in creating a national curriculum? No. The law that governs the U.S. Department of Education clearly states that no officer of the federal government may “exercise any direction, supervision, or control” over the curriculum or program of instruction of any school or school system. Yet Duncan has insisted that states eager for race to the top funding or for NCLB waivers must adopt “college and career-ready standards,” widely understood as the Common Core State Standards in mathematics and reading developed by the National Governors Association and the Council of Chief State School Officers, funded in large part by the Gates Foundation. Prodded by Duncan, 45 states have endorsed this national curriculum—despite the fact that it has never been field-tested. No one knows whether these standards are good or bad, whether they will improve academic achievement or widen the achievement gap. A report from the Brookings Institution recently predicted that the Common Core standards would have “little to no effect on student achievement.” Grade: F.
Have the policies promulgated by Duncan been good for the children of the United States? 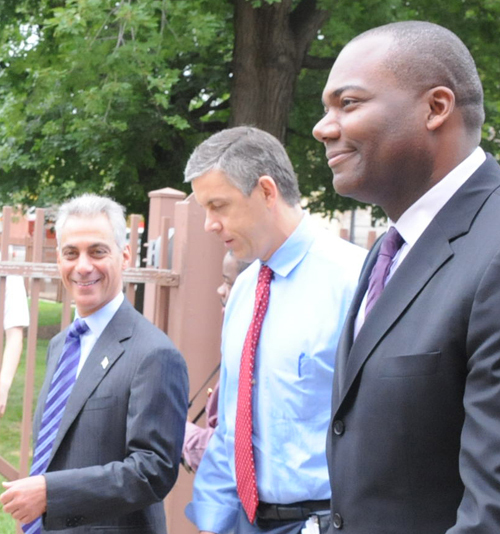 Chicago Mayor Rahm Emanuel, U.S. Secretary of Education Arne Duncan, and Chicago Public Schools "Chief Executive Officer" Jean Claude Brizard at Chicago's Carl Schurz High School on September 9, 2011. Substance photo by George N. Schmidt.No. Most parents and teachers and even President Obama (and sometimes Duncan himself) agree that “teaching to the test” makes school boring and robs classrooms of time for the imaginative instruction and activities that enliven learning. The standardized tests that are now ubiquitous are inherently boring. As President Obama said in his State of the Union address, teachers should teach with “creativity and passion,” but they can’t do that when tests matter so much. Spending hours preparing to take pick-the-bubble tests depresses student interest and motivation. This is not good for children. Yet Duncan’s policies—which use test scores to evaluate teachers and to decide which schools to close and which teachers to pay bonuses to—intensively promote teaching to the test. This is not good for students. Grade: F.
Do Duncan’s policies encourage teachers and inspire good teaching? No. Duncan’s policies demean the teaching profession by treating student test scores as a proxy for teacher quality. A test that a student takes on one day of the year cannot possibly measure the quality of a teacher. (Officially, the administration suggests that test scores are supposed to be only one of multiple measures of teacher quality, but invariably the scores outweigh every other component of any evaluation program, as they did in New York City’s recent release of the teacher ratings.) Nor do most teachers want to compete with one another for merit pay. Duncan cheered when the superintendent of the Central Falls, Rhode Island, school district threatened to fire every teacher in the town’s only high school; the Education Secretary memorably said that Hurricane Katrina—which wiped out public schools and broke the teachers’ union in New Orleans—was the best thing that ever happened to the school system in that city. Teachers are demoralized by such statements. They want to collaborate around the needs of the children they teach, but federal policy commands them instead to compete with one another for dollars and higher test scores if they want to stay employed. The Metlife Survey of the American Teacher, released March 6, reports a sharp decline in teacher morale since 2009: the percentage of teachers who are “very satisfied” with their job dropped from 59 percent to 44 percent, and the percentage who said they were likely to leave the profession grew from 17 percent to 29 percent. This happened on Duncan’s watch. Grade: F.
Have Duncan’s policies strengthened public education? No. Duncan has required states to create more privately-managed charter schools to be eligible for Race to the Top funding, putting pressure on state governments to privatize public education. In response, state legislatures are authorizing many more such schools, whose budgets are drawn from the funds of local public schools. A small proportion of these new charter schools will get high scores, and some will get those scores by skimming the top students in poor communities and by excluding children with disabilities and children who are English language learners. Such practices are harmful to public schools, which will continue to educate the overwhelming majority of students—with fewer resources than before. In some states, such as Michigan and Ohio, large numbers of charters are run for profit, which creates additional incentives for them to avoid low-performing and thus expensive to educate students. Although charters vary widely in quality, they do not produce better results on average than regular public schools. Conservative governors such as Mitch Daniels in Indiana and Bobby Jindal in Louisiana have taken Duncan’s advocacy of choice to the next level and endorsed vouchers, which further undermine public education. Despite these well-documented issues, Duncan continues to urge the expansion of the charter sector and has ignored the depredations of the for-profit charter sector. Grade: F.
Has Duncan defended public education and public school educators against attacks on them? No. Although he is a Democrat, he has been absent when public education and public school educators were under siege. When Wisconsin Governor Scott Walker decided to eliminate collective bargaining rights for teachers and other public sector workers, Duncan was silent. When Indiana Governor Mitch Daniels pushed through a voucher bill that provides public funding for students to attend private and religious schools, Duncan was silent. When Louisiana Governor Bobby Jindal endorsed sweeping voucher and charter legislation, Duncan was silent (indeed, he described Governor Jindal’s choice for state commissioner to promote his extremely conservative education agenda as “a visionary leader”). When other governors proposed legislation to remove due process rights from teachers, to slash education spending, and to expand the privatization of public schools, Duncan was silent. Grade: F.
Will Duncan’s policies improve public education? No. Under pressure to teach to tests—which assess only English and math skills—many districts are reducing the time available for teaching the arts, history, civics, foreign languages, physical education, and other non-tested subjects. (Other districts are spending scarce dollars to create new tests for the arts, physical education, and those other subjects so they can evaluate all their teachers, not just those who teach reading and mathematics.) Reducing the time available for the arts, history, and other subjects will not improve education. Putting more time and money into testing reduces the time and money available for instruction. None of this promotes good education. None of this supports love of learning or good character or any other ideals for education. Such a mechanistic, anti-intellectual approach would not be tolerated for President Obama’s children, who attend an excellent private school. It should not be tolerated for the nation’s children, 90 percent of whom attend public schools. Grade: F.
Overall, Secretary Duncan rates an F.
We will someday view this era as one in which the nation turned its back on its public schools, its children, and its educators. We will wonder why so many journalists and policymakers rejected the nation’s obligation to support public education as a social responsibility and accepted the unrealistic, unsustainable promises of entrepreneurs and billionaires. And we will, with sorrow and regret, think of this as an era when an obsession with testing and data obliterated any concept or definition of good education. Some perhaps may recall this as a time when the nation forgot that education has a greater purpose than preparing our children to compete in the global economy. Secretary of Education Duncan should have fought vigorously against all these pernicious developments. He should have opposed the misuse of test scores. He should have opposed the galloping privatization of public education. He should have demanded the proper funding of public education, instead of tolerating deep budget cuts as “the new normal.” He should have spoken out against states that passed along the cost of higher education to students, putting it out of reach for many. But he has not. He should have upheld, in word and deed, the dignity of the teaching profession. Unfortunately he has not. Even more unfortunately, it is hard to find any leader of either party who stands forthrightly today as a champion of students, teachers, public schools, and good education. This is a tragedy of our times. [Editor's Note: The above article originally appeared on the New York Review of Books blog on March 7, 2012, Flunking Arne Duncan, By Diane Ravitch].